Heat oven to 180 C 350 F or gas mark 4. Line two baking trays with non stick baking paper. Mix the flour, ginger, cinnamon and bicarbonate of soda in a large bowl. Cut butter into chunks. Rub it into the flour until the mixture looks like breadcrumbs. Stir in the sugar. Break the eggs into a small bowl and mix in the syrup. Add it to the flour. Stir everything together and squeeze into a smooth dough. Roll out until it is as thick as your little finger. 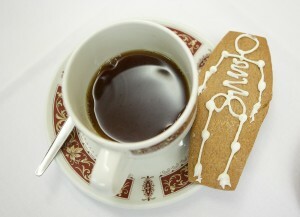 Cut dough into coffin shapes using a template and place onto the trays. Bake for 12-15 minutes until dark golden. Leave biscuits on the tray for a few minutes, then place on a wire rack to cool before decorating. Enjoy! This entry was posted in Misc by Jean Francis. Bookmark the permalink.